Musical Fidelity V-Link promises to 'perfect' laptop music | What Hi-Fi? 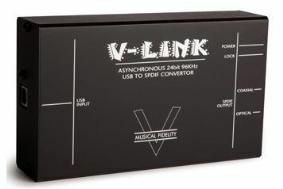 The V-Link is a 24-bit/96kHz Asychronous USB to S/PDIF converter with both coaxial and optical outputs. It features a low-jitter power supply feeding a high-precision digital clock. Musical Fidelity claims this enables the V-Link to 're-clock' the data coming from the USB port with far greater accuracy. Quite boldly, the company claims 'jitter is immeasurable and data transfer is perfect'. Tony Jones, product manager at Armour Home - UK distributor of Musical Fidelity, says: "Today, more and more people are storing their cherished music collections on computers. However, until now, there have been serious limitations with regard to the sound quality obtainable from a computer's standard USB outputs"
He continues: " The V-Link offers both optical and coaxial S/PDIF outputs. Choosing the optical option completely overcomes the problems of galvanic isolation, which, in the case of computers connected to audio equipment, refers to the 'digital noise' that leaks into the audio circuitry via interconnected earths." We look forward to putting those claims to the test when we review the Musical Fidelity V-Link - which is avaialble now, priced £100.